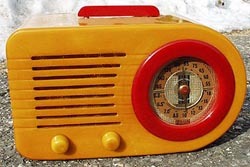 A classic of Art Deco industrial design, FADA radios were the creation of Frank A. D'Andrea who began the company in 1920 in Long Island City, New York. Originally known by the makers name as the F. A. Andrea Co. and then the initials of the founder, FADA at first made only a variety of radio components such as coils, condensers, etc.which were in great demand as the radio boom of the twenties began. Moving beyond component manufacturing, FADA began assembling complete radios in 1923 to designs done by Mr. D'Andrea, utilizing modern plastics such as bakelite and catalin in a streamlined, Art Deco design. FADA designs were extremely popular as an attractive Art Deco everyday object affordable by the masses. Frank D'Andrea was more of an inventor than a businessman, and he experienced a great deal of labor strife with both his employees, totaling about 600 at the peak, and his fellow executives. FADA was sold to a group of Boston investors in 1932, and when demand and production continued to stagnate, the company filed for bankruptcy protection in 1934 following the difficult years after the Great Depression. Frank D'Andrea left the company and founded the Andrea Radio Corporation which manufactured inexpensive radios both under its own name and private labeling radios for others. A group of New York investors brought FADA out of bankruptcy and operated it until the 1940s, suspending production during World War II in order to make electronic components for the U.S. military. After the war, they continued to produce the original designs in the modern plastics and the distinctive metal decoration before permanently suspending operations in the 1950s. FADA radios were of moderate quality and price but carried the distinctive design in the use of industrial plastics in the Art Deco style-- the reason they are so highly collected today. 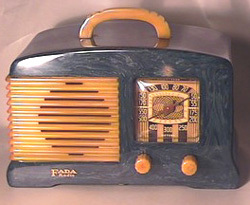 FADA radios appeal to collectors of Art Deco, plastic, radios, and industrial design enthusiasts. 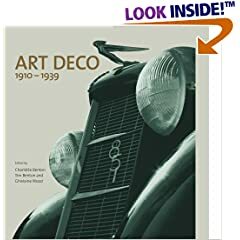 Buy period Art Deco furniture and decorative arts on the Art Deco & Art Nouveau and Fine Antiques pages, or search the entire site for great antiques, collectibles, and crafts for every collector! Sell or consign period Art Deco ceramics, glass, lamps, sculpture, and more at Collectics, where we earn our customers' trust everyday! Read about our top performing national consignment program for estate and personal collections.